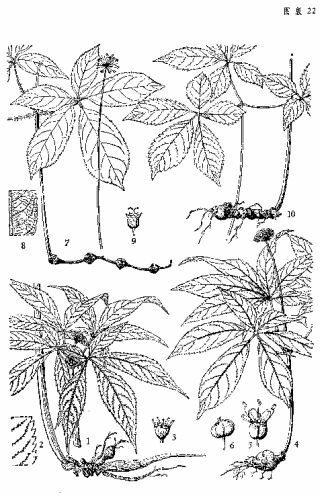 Ginseng notoginseng (chinese shi -ti , 田七, or san-ťi , 三七) together with ginseng is a true member of the genus Panax ( Wen1996pbp ). It is a separate species ( Panax pseudoginseng Wall. ), Not Panax pseudoginseng var. Notoginseng , as it is sometimes mentioned (see taxonomy of ginseng genus ). Like ginseng, even notoginseng contains a large number of panaxosides, which are its main active ingredients. These notoginsengu properties are realistic and make this plant an excellent means of preventing and treating heart and stroke. Notoginseng is also part of TČM potions for healing superficial skin injuries and scarring. It is typical for TČM that it does not understand the effects of this plant scientifically, but magically and mnemotechnically - notoginseng is said to act on the paths of the heart, the uterus and the liver, thereby supporting blood circulation throughout the body and suppressing the pain. In contrast, scientific medicine knows that, in fact, notoginseng dampens the inflammation and the associated pain by acting on white blood cells and their immune communications. Notoginseng actually improves blood circulation, but not by acting on one or the other of the 12 drachmas that flow in the body through the life energy of qi , but by acting against vascular NO synthase to protect against atherosclerosis and to enlarge the blood vessels. Increasing the vascular diameter further contributes to the suppression of stabbing pain in the heart (called angina pectoris ) known to top athletes and people suffering from heart disease and coronary arteries. The effect of notoginsengu against joint pain (rheumatoid arthritis) was confirmed experimentally ( Chang2007aeb ) and clinically ( Zhang2007cse ). The anti- rabies effects are notoginseng like ginseng right ( Wang2016pap ), in colon cancer the effects of notoginsengu are even greater ( Sun2011rnh ). Notoginseng has a strong protective effect on the liver ( Lam2016hec , Ng2006pas , Yoshikawa2003snd , Liu1994ech ). Notoginseng was effective against fatigue in animals ( Zhou2012aep ).